ItemB-09435 - Nanaimo Regional General Hospital. ItemB-05797 - Final concentrate tables at tin plant; Cominco Sullivan Mine, Kimberley. ItemB-05798 - Tipping of slag at tin plant; Cominco Sullivan Mine, Kimberley. ItemB-05805 - "Primary M.S. machines, CMS Co. concentrator, Kimberley BC." ItemB-05807 - "Concentrator conveyor belts (concentrates to cars) CMS Co. concentrator, Kimberley, BC." ItemB-06070 - Salmo seen from the air. ItemB-05808 - "Year 1923"; Cominco Sullivan concentrate loading sheds and stockpiles, Kimberley." ItemB-05809 - "The CMS Co. concentrator, Kimberley." ItemB-05815 - "Air compressors, CMS Co. concentrator, Kimberley, BC." Item B-05807 - "Concentrator conveyor belts (concentrates to cars) CMS Co. concentrator, Kimberley, BC." 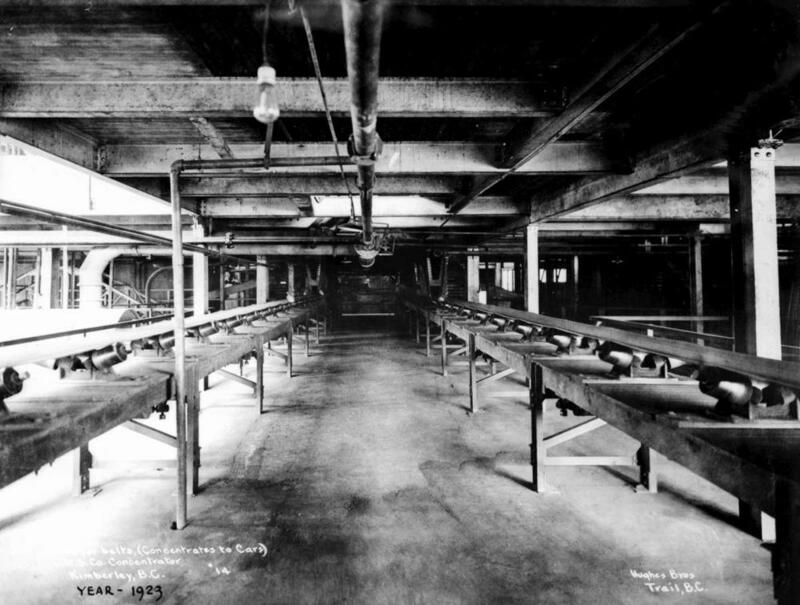 "Concentrator conveyor belts (concentrates to cars) CMS Co. concentrator, Kimberley, BC."